Combination hologram creates an impact that has extra-ordinary viewing effects and also security features. Usually, it's good to combine different hologram feature together. For example, to add dot-matrix hologram which has shiny kinematic movements effect into 2D/3D hologram which has sharp logo/text with deep viewing depth in second layer. It's also is available to add hidden text and micro text into 2D/3D and Dot-matrix Holographic Label.Flash light security feature and stereogram improve hologram appearance and security too. 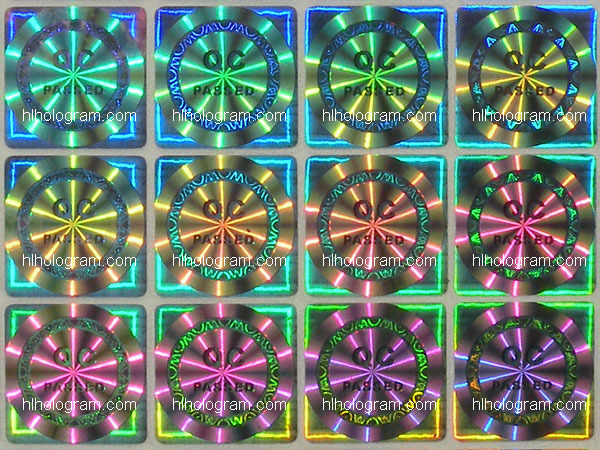 Customer also can do better security onto hologram sticker personally by adding some further security characteristics, such as serial number, barcode, overprinting onto our tamper evident hologram or special tamper evident pattern released hologram. 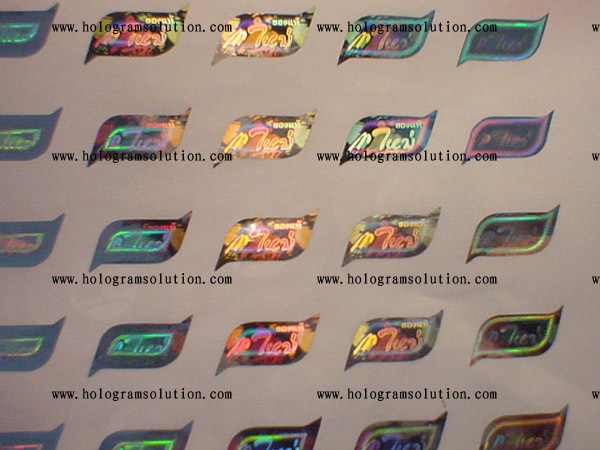 To improve security, we recommend to make dot-matrix hologram + 2D/3D hologram+ 2D hologram + hidden text + micro text + flip-flop + kinematic guilloche elements, parttern released material and print sequential numbers onto holographic sticker. A. 2D/3D Hologram and Dot-matrix (digital) hologram combination. Combination of Dot-matrix (digital) hologram and 2D/3D hologram, with micro text. Combination of Dot-matrix (digital) hologram and 2D hologram, with kinematic guilloche elements. Combination of Dot-matrix and 2D/3D hologram with rotation and zooming dots. Combination of Dot-matrix and 2D/3D hologram with true color bottle. Combination of digital Dot-matrix and 2D/3D hologram. B. Hidden text and Micro text combine with 2D/3D, Dot-matrix Holographic Label. Hidden text has Laser beam readable hidden text and Morie decode film readable encryption data/covert image. Cover hologram image element requires a specific viewer or decoder, including optically-encoded elements. The morie hidden text 'SECURE' only display after we cover decode film onto above hologram sticker. The readable hidden text/logo is an encryption data on the hologram area. The more security features recombination into hologram made and the more further security functions we assembled onto hologram, the difficult counterfeiter to duplicate the hologram sticker.